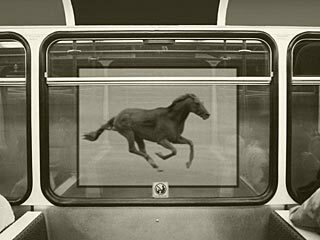 The proposed artwork, entitled Running Horse, will consist of a row of images attached to the walls of two of Calgary’s C-Train tunnels. When seen by passengers, these images will combine like a flip-book to create an animated image of a horse galloping beside the train. The two proposed tunnel locations are both on the C-Train’s Somerset-Bridlewood/Crowfoot line. The first, for those traveling south from the downtown core, immediately precedes the Victoria Park/Stampede station. The second, for northbound passengers, emerges at Erlton/Stampede. Next: Why a running horse?